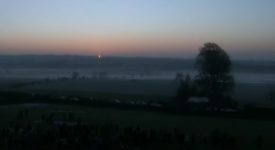 Hundreds of thousands of people across the world were able to view the traditional Winter Solstice sunrise at Newgrange, Ireland live via the internet for the first time on 21st December 2007. The event was also broadcast live on RTÉ and via satellite to television stations all over the world. Newgrange (Dún Fhearghusa) can be visited by guided tour from the Brú na Bóinne Visitor Centre in Donore, Co. Meath. Over the past 20 years, the sky had been clear only two years out of every six. The Winter Solstice sunrise illuminated the inner chamber of the tomb for 17 minutes. Weather conditions were perfect as the Winter Solstice sunrise illuminated the inner chamber of the ancient tomb for about 17 minutes. Over the past 20 years, the sky had been clear only two years out of every six. Newgrange (Dún Fhearghusa in Irish) is the most famous of all Irish Stone Age sites and one of the most famous prehistoric sites in the world. Built circa 3200 BC, some 500 years before the pyramids of Egypt and 1000 years before Stonehenge in Britain, this Stone Age cemetery is one of the oldest solar aligned buildings known in the planet. 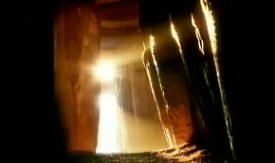 The passage tomb was built in such a way that a narrow beam of sunlight could illuminate the floor of the burial chamber at the end of the long passageway only for a very short time at dawn on the shortest day of the year. 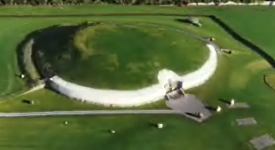 Last year, the Office of Public Works received over 30,000 applications from people wishing to witness the Winter Solstice at Newgrange, out of which only a lucky 59 of them were chosen by lottery.